This event was one of my favourite I have been to this year. The venue, the food and the wine were all of the highest quality which made the lunch an unforgettable experience. 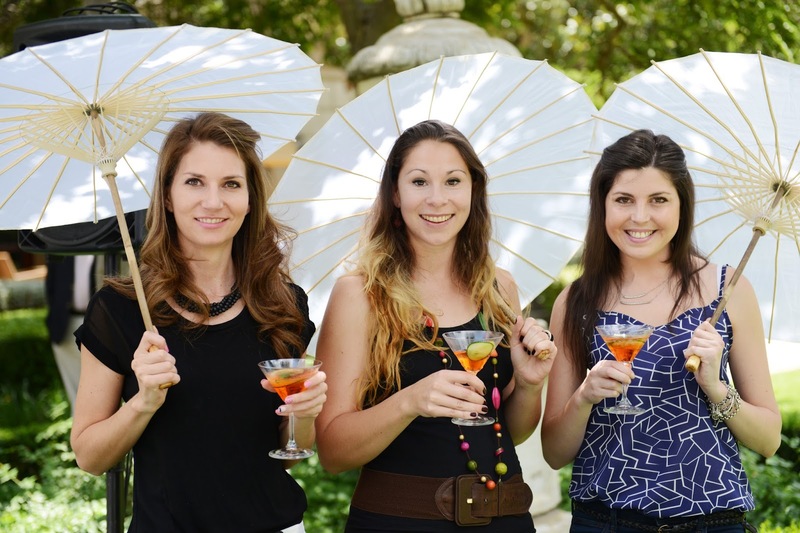 We arrived at the spectacular Palazzo Monte Casino gardens and were each given a pretty white parasal and a delicious cocktail. There was a lovely singer performing which added to the classy affair and transported us to a scene from Downton Abbey. Next, we went through to the dining area which was just incredible. I felt like we were in a secret garden wine cellar, the perfect setting to pair KWV wines with delicious food from celebrity chef and KWV brand ambassador, Mynhardt Joubert. 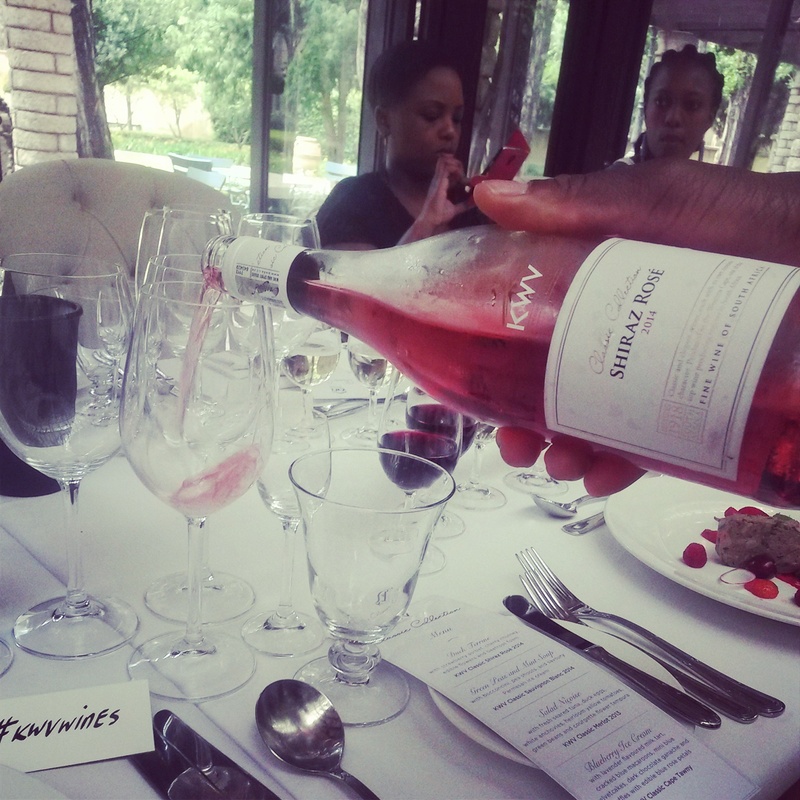 We sat down and prepared to experience the reason why we were all invited - to sample the KWV classic collection. "The KWV classic collection is a versatile and sophisticated range of wines" - KWV global brand manager, Charlene Engels. First up was the Duck Terrine with strawberry sorbet, cherry chutney, edible flowers and beetroot foam, all paired with the KWV Shiraz Rose 2014. Food wise, this was my favourite dish, the colours were so stunning and everything on the plate was the perfect combnation of savoury and sweet. The Rose complimented this combination with it's easy drinking sweet taste. Following the vibrant red dish was this green peas and mint soup with boccomcini, pea shoots and savoury parmesan ice cream. The peas and mint combination was so refreshing and had a touch of saltiness which was great after the sweet first course. The KWV Classic Sauvingnon Blanc 2014 was served with this and it is possibly my favourite wine of he collection. 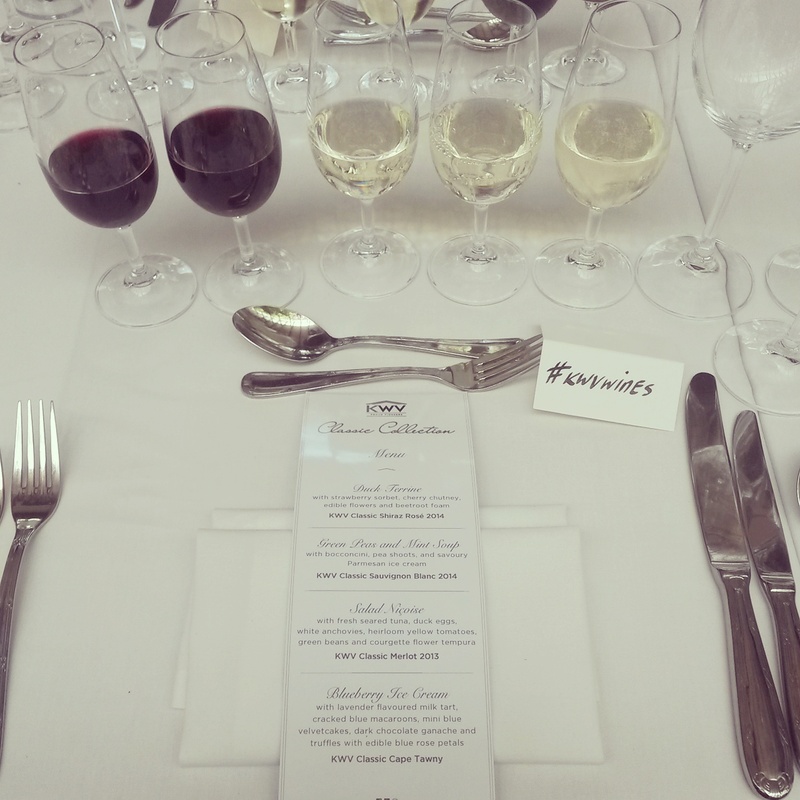 Food pairing is so important when wine tasting as it brings out the flavours in the wine. Ordinarally I might not have enjoyed the Sav Blanc as much but because it was paired so well, I thoroughly enjoyed it. A salad nicoise comprising of fresh seared tuna, duck eggs, white anchovies, heirioom yellow tomatoes, green beans and a courgette flower tempura was served next. The tuna, eggs and tempura made this quite a heavy dish and so it was paired with a slightly chilled KWV Classic Merlot 2011. This again illistrates the importance of pairing. Merlot is one of my least favourite wines as I find it too harsh and often lacking flavour. The KWV classic range is such easy drinking and paired with this fantastic yellow dish, I found the merlot very tasty! Blueberry ice-cream, lavender-flavoured milk tart, cracked blue macaroons, mini blue velvetcakes, dark chocolate ganache and truffles with edible blue rose petals was the dessert. Have you ever? As if this final dish wasn't impressive enough, it was served with the KWV Classic Cape Tawny - South Africa's most awarded wine locally and internationally. The Tawny didn't dissapoint and deserved all the praise given to it - a definite ust try!!! Upon depature, I had a very happy tummy and a delighted palete. 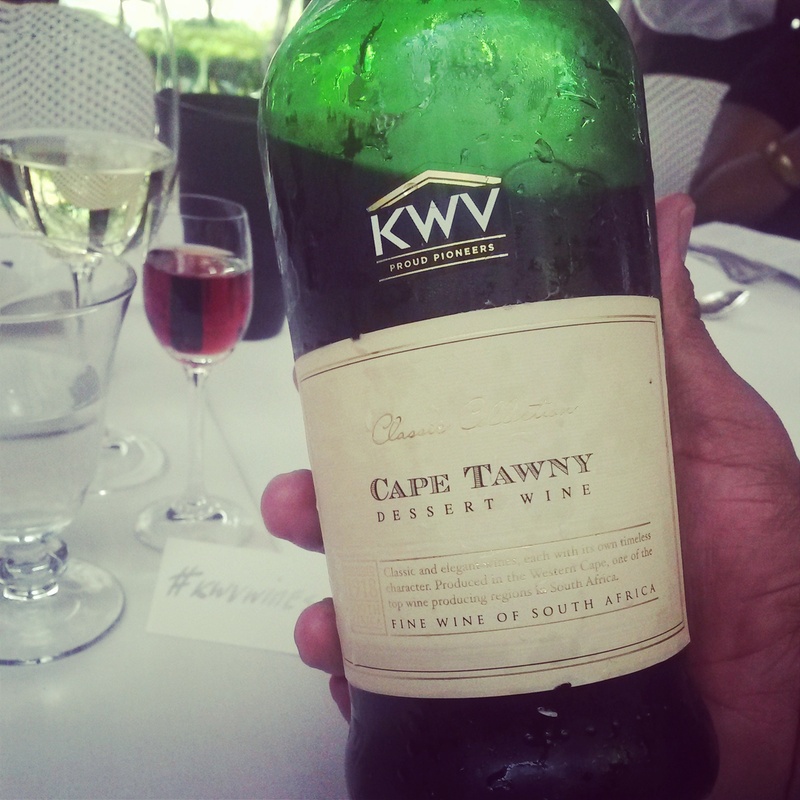 The experience left me with a greater appreciation of the KWV brand. Not only is this brand proud and pasionate about what they do but their wines are truly are at the top of their game! We were each given a bottle of the Moscato to take home and mine is patiently sitting in the kitcen cupboard waiting for an occassion and guests special enough to share this divine treat with. 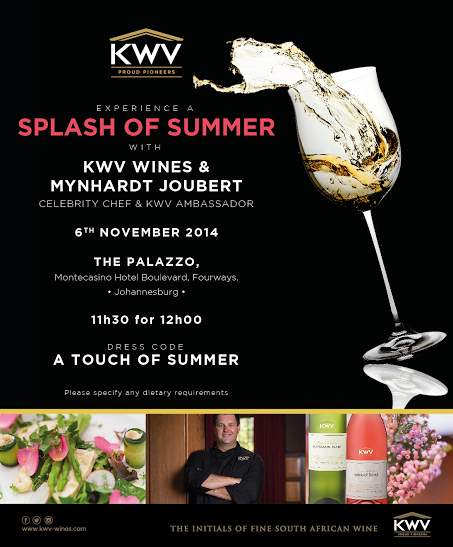 Thank-you KWV for an amazing experience!